An introductory chapter provides a comparative statistical analysis of the use of anti-dumping by the thirteen countries, highlighting key features of anti-dumping systems in a comparative way. The introduction also assesses the important impacts of China’s accession to the WTO in 2001 and of the economic and financial crisis of 2008–2009, discusses the treatment of non-market economies, and notes emerging tendencies in anti-dumping reform. This is an invaluable work on a key area in trade (and competition) law, written by a team of well-known experts. 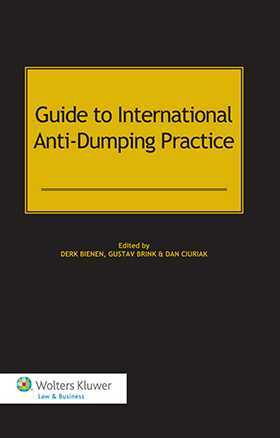 With its comprehensive and practical format, the book will be of great interest to practitioners dealing with anti-dumping cases, including trade law practitioners who may have to defend anti-dumping cases in different jurisdictions, attorneys in international trade law and competition law, government officials, academics, and researchers. Chapter 1. Overview; D. Bienen, G. Brink, D. Ciuriak. Chapter 2. Argentina; M. de Artaza, T. Cwierz. Chapter 3. Australia; S. Lacey. Chapter 4. Brazil; C. Saldanha-Ures. Chapter 5. Canada; D. Ciuriak. Chapter 6 . China; G. Brink. Chapter 7. European Union; D. Bienen. Chapter 8 . India; N. Raghuwanshi, G. Brink. Chapter 9. Korea; J. Lee. Chapter 10 . Mexico; J. Miranda, E. Díaz-Gavito. Chapter 11. New Zealand; H. McPhail. Chapter 12. South Africa; G. Brink. Chapter 13. Turkey; M. Yilmaz. Chapter 14. United States; G. Horlick, P. Clarke, C. Benoit .